All the way back in June 2014, Matt asked the Ministry of Transport if he could see some of the background research that informed the 2015/2016 Government Policy Statement on Land Transport Funding. They were slow in responding to his Official Information Act request, but the information has gradually trickled out. Two days before Christmas, MoT sent him a long, very interesting working paper on New Zealand’s capital spending on roads. Over the next four weeks, I’m going to review some of the key findings from the paper. To briefly summarise: there are big issues with the land transport budget. The paper suggests that current road spending may represent a massive misallocation of capital. To their credit, MoT appear to be acknowledging this. However, it doesn’t seem to have percolated up into the investment decisions being made by the Government. What does all this mean? I had two very different reactions – one technical and one policy-focused. Omitted variable bias – it seems like NZIER may have assumed that traffic grows in proportion to one or two variables – e.g. population and economic growth. In doing so, they may have excluded other important variables, such as the structure of the economy, the location of projected population growth, and the impact of technology (e.g. online shopping, smartphones, video calling). Model mis-specification – NZIER may have assumed a positive, linear relationship between (say) income levels and per-capita VKT. However, the actual relationship may be more complicated. It might actually be true that people drive more until they reach a certain income level, and then start driving less. Inappropriate assumptions about causality – Regression models measure the degree to which two variables are correlated. Establishing that there is a causal relationship is much more difficult. NZIER may have (wrongly) assumed that a past relationship must necessarily hold true in the future. And they probably haven’t explicitly accounted for the impact of investment decisions in shaping demand. But that’s all just economic mumbo-jumbo. Ultimately, I’m more worried about the implications of these forecasts for investment decisions. Are bad forecasts being used to justify a road-heavy investment programme? 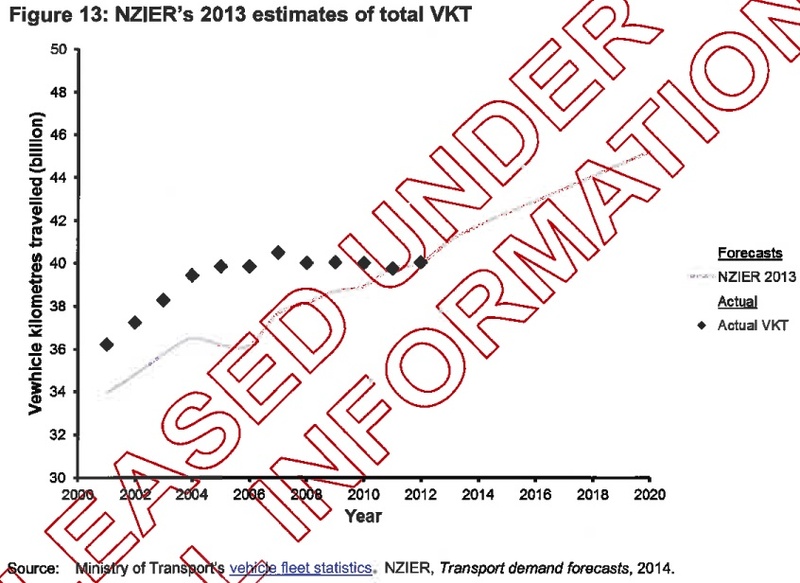 If NZIER’s forecasts are being sensibly discounted (and ignored) by transport agencies, I’m not that worried about them. Economists (myself included) make ludicrous statements on a regular basis, usually to little effect. But if they are being taken seriously, New Zealand’s taxpayers should be concerned. If policymakers and planners are basing major investment decisions on the NZIER forecasts, they may misallocate scarce funds to roads that will not be needed. That is money that could be better spent on other things, such as bringing New Zealand’s underdeveloped public transport and walking and cycling options up to scratch, building new schools and hospitals, or rebuilding Christchurch. Next week: What’s happened to BCRs for new state highway projects? The graph with the NZIER forecast can now be updated to 2013: travel in that year was 40.256 billion km, up 1.2% from 39.780 billion in 2012, which would be the last data point in that graph. Again, that’s a much lower rate of growth than the forecast would suggest, despite fuel prices remaining quite stable (although GDP probably fell a little short of expectations). Looking at the data on a quarterly basis, though, travel was starting to trend up again in 2013-early 2014, and may well have kept doing so through the rest of 2014 – data not out yet. what forecast? That’s an ideological pen stroke. Yikes it can’t be good for NZIER’s reputation when their forecasts are even being discounted by the dinosaurs at MoT. The other thing that these analysis are missing (at least in the summary form shown) is the breakdown of VKT actual and prediction) by vehicle type. 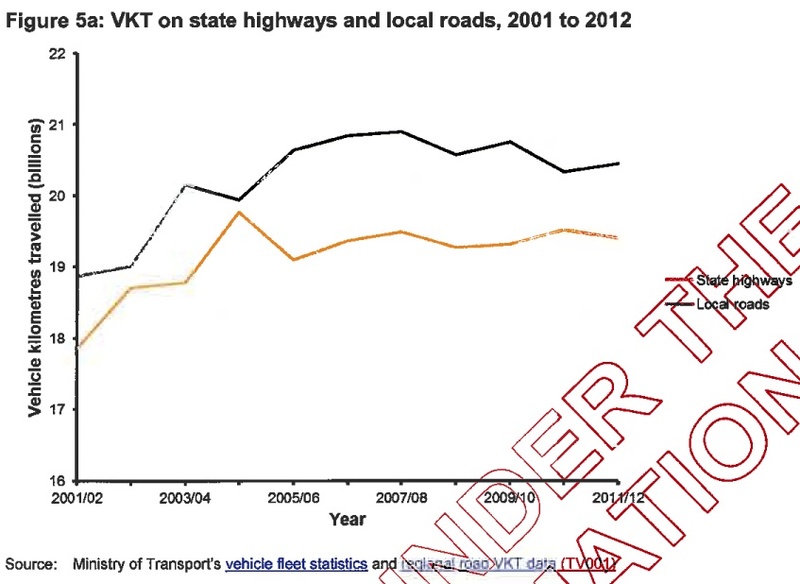 If car traffic which is 80% of the VKT is mostly flat but heavy truck traffic is increasing then that implies more freight on the road – but that might show and overall upward trend in VKT. Likewise, if car traffic was declining, while light truck and heavy truck (inc. buses) was going up that too would show and over all trend of up. But both scenarios and the one in which all modes were up would paint completely different responses from the planners/MoT/NZTA in terms of what roading projects are needed. Yes something is seriously rotten in the state of NZIER. But one thing is certain all these models show “Business As Usual” resuming in short order after a period of flat growth. Not one of these models has ever predicted anything like reality, so while NZIER is obviously got its models wrong, perhaps we need to look down to the road the shop where these guys all get their “traffic model supplies” from and also at the customer and what they are wanting the models to actually do? Looks to me like the only models that get chosen are those that show lots of growth in the future, with maybe a shortish flat line now, so we [the customer] don’t have to immediately ramp up spending but show we will have to in the next couple of years. 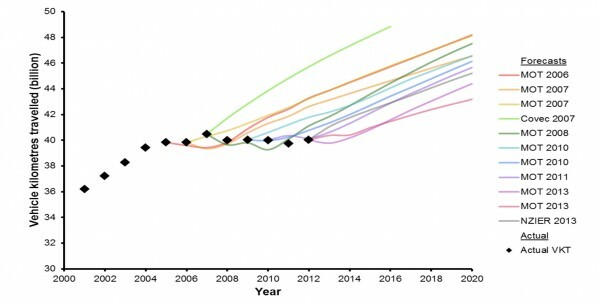 all the more recent models prediction graphs are getting a little flatter – but thats only I suspect because of the weighting applied to more recent traffic VKT but you can see that these models all believe the growth forever model with traffic is still with us, despite a lot of evidence the contrary. Realistically, we will be spending money on curve-straightening and passing lanes for many years to come. A lot of rural roads (and urban roads) are unsafe to drive on. Given the number of accidents and deaths we have on the road every year, it’s worth spending this money even if traffic volumes on unsafe stretches of road are not increasing. However, as I’ll discuss next week, that’s _not_ where the majority of the money is being spent. There’s a huge need for run-off areas, side barriers, audio-tactile markings, central wire ropes, and other things which prevent a driver’s mistake from becoming the cause of death or injury. There’s also a significant need for work to determine the appropriate speed of a section of road. None of this is *cheap*, but it certainly isn’t expensive compared to the cost of RONS-style megahighways. In Auckland especially and the other cities if public transport improvements using best practice and separated cycle paths like Copenhagen or some form of planted barrier is used with about 800mm protection, there is zero chance projections are going up if both networks are high standard. Regardless of imbalanced budgets professional engineers have clear cut ethical obligations for community well being, sustainability, resources best used for future generations. I think the whole transport industry is in breach of those right.now in particular motorway projects. No professional engineer can argue about a rapid busway in one lane each way or the Copenhagen mode shares. Both even with 50% proven mode shares will reduce traffic by 37% and proven potential to double that. So why are we widening for car lanes anywhere needs to be the question. The industry can already be proven to being negligent why make the damages claim bigger. Now apart from zoning parking off arterial roads, and a fleet of buses, $300m if diesel, $600m if hybrid , and opening up bus lanes full scale where we have at least one lane for car, I think the City of Auckland needs to pay nothing except rail, and cycle infrastructure improvements. And a probable claim of congestion back against the industry for not opening these 2 networks up sooner. In the interest of our Engineering ethics, every possible cent and space available on our riads should be made by opening up the PT and cycle network. If buses are the problem buy them it is only $300m for a whole bus fleet. Signed Chartered Civil Engineer 173248 with 22 years roading experience. I’m making a complaint to IPENZ as believe the entire transport industry is neglecting their ethics at detrimental results to sustainability and community well being. I want my kids to cycle to school for heavens sake and have a better future. A key issue in VKT in developed societies is market saturation. It is widely observed that as a society first develops sufficient wealth for widespread private vehicle car ownership and focusses on driving infrastructure then economic and population growth are usually correlated to private vehicles ownership and use rates. Or driving rates accelerate ahead of other the indicators as happened in NZ in the postwar era. China more recently. But this is a one time thing, that was unleashed in NZ especially by cheap second hand imports. However once certain levels are met then this market is mature and flattens off. In fact many of the richest societies actually drive considerable less than they used to. They may buy new cars more often, but drive them less and less. Some driving is for pleasure, much is out of need. Naturally physical factors are important here; the Swiss drive less than Arizonans, largely because urban dwellers drive less than suburban people, who drive less than rural people, understandably. The NZ driving ‘market’ shows every sign of have reached a saturation point earlier this century, hence the flat line. Ah, our population is growing, yes, but it is also urbanising. So we would expect to see Transit use growth above the rate of population growth in urban centres of scale that are growing. Exactly what is observable. In Auckland’s case massive increase in uptake, 8% across the board, 18% on the Rapid Transit Network [Rail and Busway]. As a basis for policy settings, especially for infrastructure investment in cities, the data shows that growth [change] in Transit demand in Auckland is more like driving demand was last century and driving demand, despite multi-billion dollar attempts to make driving more attractive, flat, only subject to little climbs followed by corrections. To assume that driving and the economy are in lock-step like it’s still the 1970s, and there is unmet latent driving demand in NZ, looks like a kind of baby fail by NZIER: Walking backwards into the future only seeing the past, and the rather distant past too. We’re also flying a lot more than we used to, 15-20 years ago. I don’t know anyone who would drive Auckland-Wellington if they could avoid it. The real price of air travel continues to decline, while the cost of road travel has increased substantially. NZIER is not along in this. And based on those other scenarios from MoT and others since 2006 or so, so have lots of others and they’ve all been wrong wrong wrong yet show no sign of correcting their problems. So, what well are these guys drinking from that they all keep on printing the same crap year in year out and hoping agaisnt hope that one day one of the predictions will actually happen? 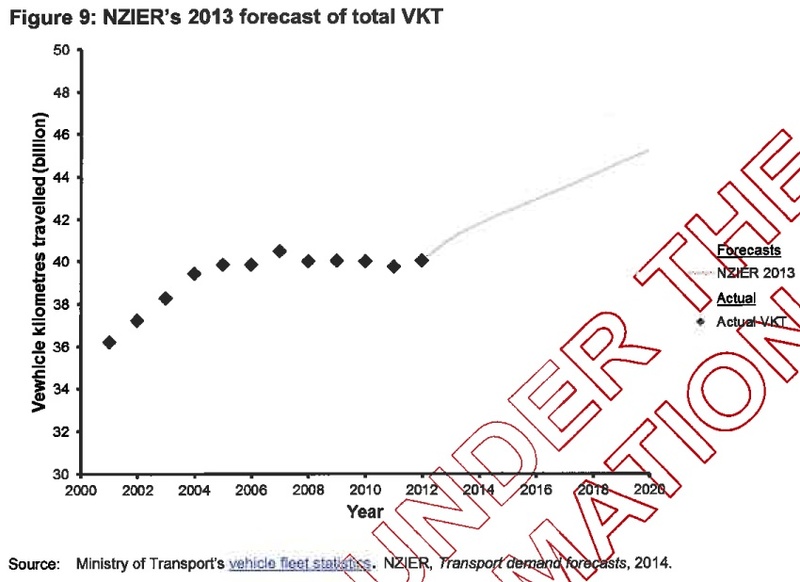 The only “prediction” that seems to correlate correctly, VKT and economy is the ANZ with their Truckometer. But even then you have to wonder how accurate it really can be in a ongoing flat VKT scenario like we have had for the last 8+ years. In that time the economy has shrunk, grown and grown again, yet VKT is more or less the same. So the link between growth and VKT is not the same as it was. And NZIER’s response is ………. (Just keep up the pills and ointment until it does). Quote: ‘we are being very cautious in our forward looking models’. hmmmm NZIER? So the vkt flatlined even though during the same period the government shut down freight rail lines? Up to 2008 and the demise of the last Labour Govt, major spending on new roading projects had all-but been put on hold, and that government in its last days focussed on things like buying back the railways, and funding the Auckland and Wellington rail-upgrades. This seemed a wise strategy which fitted in with the way the developed world was going, and also made a start at reducing New Zealand’s heavy over-dependence on one, vulnerable mode of transport, road. But then along came National with its ideas straight from the 1960’s. In particular was a former radio-station founder and entrepreneur called Steven Joyce whose knowledge of transport in NZ was, 1) Kiwis love cars, therefore we need more roads, 2) Railways are outmoded and a black hole for cash, therefore we would be better off without them. And recognising the worth of these credentials, a Currency trader called John Key put this radio station entrepreneur in charge of New Zealand’s entire transport strategy. So on the basis of 1) and 2) above, the investment taps for rail were turned off (see note*) and vast sums were promised for a handful of pipe-dream motorway-projects seemingly hand-picked by Steven Joyce based on nothing more than his whim. Real-world future traffic requirements or robust business-cases did not come into this and scorn was poured on anyone who suggested that they should. The ‘borrow-and-spend’ policy needed to fund all of this required asset-sales and cuts to just about every other area of government, but the projects were pitched as ‘nationally significant’ and ‘economically essential’ to an unquestioning public, a hungry roads-lobby, and a sycophantic news-media. Then in 2011 the electorate returned National again. The mantle of ‘Fat Controller’ of New Zealand’s transport-policy then passed to a former woodwork teacher called Gerry Brownlee who continued with the same charade, but emboldened now by assumed voter-endorsement and an apparent dwindling-out of any meaningful voices of opposition. In spite of their very-different policy prior to losing office, Labour appeared to have nothing to say on this at all, and only the Greens made any serious attempt to challenge these policies in parliament. Fast forward to 2014, the Govt wins a third term and a last-chance to halt at least some of National’s Roads of Significance (NRonS) appears to have been lost. No amount of contrary evidence or adverse cost-benefit results can deflect these guys. New minister and former lawyer Simon Bridges, while notably keen on cycleways, shows no more interest than his predecessors in questioning the lack-of economic wisdom, upon which this misguided, multi-billion dollar road-spend is based. So it should come as no surprise that the MoT knows well that the RoNS policy is a crock, and yet does nothing to halt this ‘massive misallocation of resources’. We are all passive players in a Hans Christian Andersen type fairy-tale called “The Emperor’s New Roads”. It may not have a happy ending. Shortly after the National Govt took office, Minister Steven Joyce was approached by the newly-formed KiwiRail which managed to negotiate a series of cash-injections to fund a “Turn-around Plan”. Initially this was to be three instalments of $250m, the aim being to recover from the disastrous run-down which occurred during the privatised years, and enable rail to be self-funding thereafter, including being able to plough back large sums of profit to grow its business. Unfortunately, competition with heavily State-funded roads (remember: borrow-and-spend) and various unforseen occurrences have made this all-but impossible, and the hoped-for rail-nirvana has not eventuated. Despite record freight tonnages carried during this period, lines have closed, workshops have shut, jobs have been lost and further cuts loom. The Turn-around Plan funding was very much a one-off, ‘don’t come back for more’ type of deal, and a far cry from the many $billions liberally going into uneconomic roads. This government has certainly shown no willingness to invest in any equivalent ‘Railways of National Significance’. Well I think investment in rail is proven as being sustainable, better for future generations. electric trains cannot be beaten for capacity, spatial efficiency ie less space, better for the environment, better for adjacent communities, plus also freight advantages, and no emissions. A motorway is completely the opposite. Professional Engineers should not be endorsing the motorways to start off with. We all know better now. All RONs need to stop and look at sustainable options and what is best for community well being and future generations. This is also money that could be better spent on sustainable modes ie rail,bus,cycle and walking. Why keep focusing on car only in the majority there is a global car network, where the other sustainable modes are neglected and traffic figures are grossely factored up as the other modes are closed out. In other words a fake economy of demand and supply. Personally I fully endorse all the schemes that this blog and generation zero have come up with ie congestion free network, operation life saver etc. I actually think we can fast track the CFN within a lot of our main arterial roads right now. Separation is just a planted barrier be it stuck down planters and hedging,bus doesn’t need any protection. A lot of our arterials have enough width for full multi modal right now, and a lot of others can be split to have car, bus or car, cycle. Where I think the industry is negligent right now is in not maximising the current paved widths (including parking) and applying a rapid and a frequent network immediately and safe cycleways with all the budget, resources,seal width under their control. All motorways should have one lane exclusive for bus, the north shore busway has well and truly proved that, and for cycling well Copenhagen has demonstrated that up to 6 years ago or.more. So both things have potential for a 74% reduction in traffic. 30% gets motorway going easily. Rail well that speaks for itself, bow down, why not earlier? CRL and Skypath now!!!!! Have read parts of the report, there are certainly thing in there which are concerning to me. Looking at the figures in section 6 in particular, the discrepancies in BCR between committed/approved projects and probable/reserve projects suggests that the current program isn’t going to maximize the ability to achieve value for money. Value for money is one of the ‘strategic directions for land transport’ in the GPS. Yes but “value of spending for political purposes” is a higher ranked, and yet completely unstated requirement too. That trumps any other requirement – hence the need for NZTA to spend up its overcommitted finds largely on poor BCR RoNS as doing that makes the Government look/feel better. Yay! Another win for public transport. that is one long train… how powerful is that loco?… hauling oil, too. Like most consultants, NZIER gives the answer that the customer has paid for.